When my niece Zoe started on solids everyone remarked what a great eater she was. From the time she was about 6-months-old, she devoured apples, zucchini, and pretty much everything else we gave her. It was exciting to watch her try new foods and love them, but I think the real star of the show was Zoe’s mom, Sara. Instead of sticking with just a few tried and true foods, she methodically introduced new items one by one, giving little Zoe a more varied diet than many adults can boast! 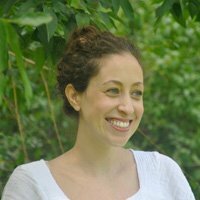 As a former food editor pregnant with my first child, I already daydream about seeing that same joy I saw on Zoe’s face as I introduce new foods to my baby. 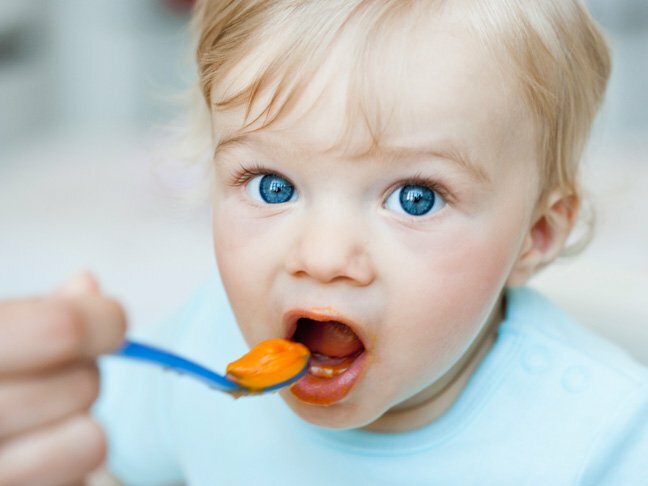 Read on for an outline of when to feed your baby certain solids. 1. She has head control and can eat in a sitting position. This one is obvious: Feeding solids to your baby any earlier will increase her risk of choking. 2. Her extrusion reflex has disappeared. The tongue-thrust reflex—which is what keeps them from choking on milk or formula—also enables children to push food placed on their tongue out the front of their mouth. Around 6 months, this reflex disappears, a sign that baby is now capable of swallowing food. 3. She’s curious about food. Watch for her to take an interest in what you’re eating. She may even try to grab food from your plate! Mix a little with breast milk or formula and feed it to your baby from a rubber-tipped spoon. Start with a fairly watered-down version and gradually thicken the consistency as she becomes more comfortable. As she transitions to solids, she’ll only need a few teaspoons at a time. These first foods are complements, not substitutions for breast milk or formula. Once she has the hang of eating cereal off a spoon, it’s time to introduce fruits and vegetables. 1. Introduce 1 new food at a time. According to the AAP, it’s important to offer only one new fruit or vegetable at a time and wait two to three days before introducing a new food. Symptoms from food allergies can occur anywhere from a few minutes to a few days after eating a particular food, so this is the best way to tell if your baby is sensitive to a specific food. 2. Thin thicker foods with breast milk or formula. “Once you baby learns to adapt you can slowly make them thicker and coarser,” says Karen Ansel MS, RDN and author of The Baby and Toddler Cookbook. 3. Start with mild-tasting fruits and vegetables, such as peas and apples. They’re less likely to cause gas or upset stomach. And remember, just because your baby shunned peaches initially, doesn’t mean she doesn’t like them. Babies often need several exposures to a new food before they learn to like it. 4. Buy (or prepare) purees with a very smooth texture. Sweet potato and avocado, for example, are good first puree choices. 6. Peel fruits and veggies with think or fibrous skins. Think acorn squash, peaches, and apples. 7. Introduce meat into your baby’s diet, too. At 6 months, breastfed babies’ iron stores start to diminish, so the AAP says this is also a good time to introduce purees of iron-rich protein like beef, lamb, chicken and turkey. Start with a very thin puree and talk to your pediatrician if you have any questions. Note: To cook produce: remove seeds/pits/skin, cut up fruits and veggies, place in a saucepan, cover with water, bring to boil, and cover and cook over low heat until tender. It’s now okay to offer combinations—just make sure there isn’t more than one food in the mix that he hasn’t tried. Texture-sensitive babies may start tolerating slightly coarser purees, so fruits, vegetables and proteins that were hard to get perfectly smooth before, like green beans and beef, may prove more acceptable to your child. Your baby’s digestive track has continued to develop and can likely handle the fiber found in heartier fruits and veggies like blueberries and broccoli. It’s also a good time to introduce new forms of protein, like fish and tofu. 1. Cut items into small pieces. They should be small enough to be easily picked up between your child’s thumb and forefinger. 2. Foods should mash easily so they are able to be gummed. This may mean cooking firmer foods to soften them. 3. Talk to your pediatrician about allergy risks. Some foods, such as strawberries, are more likely to cause allergic reactions. 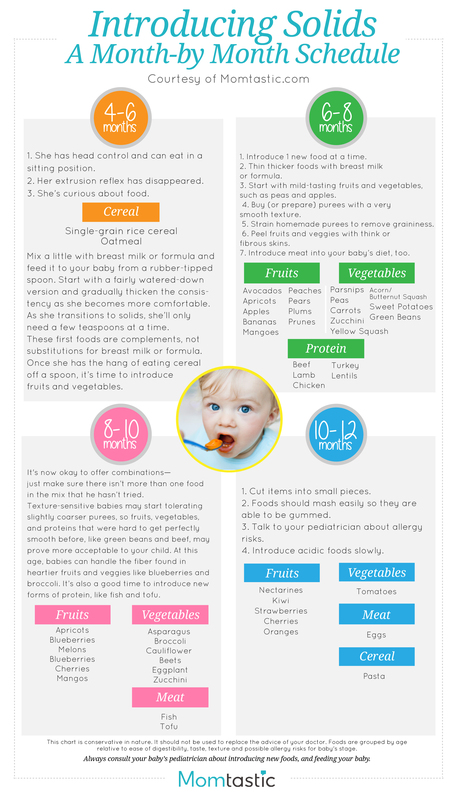 Your child’s doctor can best advise you on how to introduce those foods to your baby. 4. Introduce acidic foods slowly. Citrus fruits, like oranges and tomatoes, may be too rough on your baby’s stomach. Introduce them slowly and talk to your doctor if you suspect that your baby’s tummy is irritated. Erica Clark is a former magazine food editor turned recipe developer, tester, and food writer. She works out of the kitchen in her 1920s stone home in New York. You can find her online at StoneKitchenCreative.com.